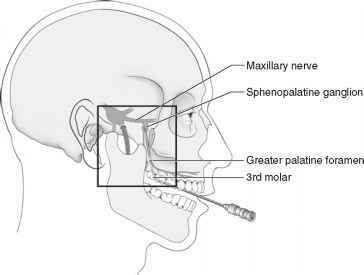 Diagram of electrode placement for the administration of transauricular electroshock. Toothless alligator clips are attached to the ears and the animal is freely moving at the time of the stimulus. The clamps of the alligator clips should be adjusted by bending such that contact with the ear is maintained without significant discomfort to the animal. The stimulus conducting wires should be flexible and lightweight such that they do not impede movement. 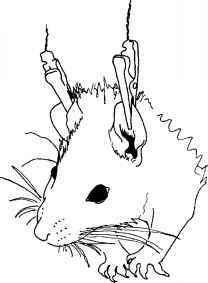 contact with the ear but are not an obvious irritation to the animal as manifested by vocalization or immediate attempts to remove the clips. Felt pads may be attached to the clamps to improve comfort to the animal. The felt pads should be soaked in saline to improve conductivity. Since the investigator must directly handle the conductive alligator clip electrodes to attach them to the animal, it is recommended that nonconducting rubber gloves be worn to prevent accidental shock to the investigator. Wiping the ears with an ethanol solution will remove dirt and oils and improve conductivity. Once attached to the clips, and therefore the stimulator, the animal may be placed in an observation cage. The observation cage should be placed near the stimulator in order that the electrical leads connecting the animal to the stimulator are kept short and the electrical resistance induced by the wire kept to a minimum. The animal is freely moving at the time of transauricular stimulation, in contrast to corneal electroshock in which the animal is lightly restrained by a gloved hand. As with corneal electroshock, transauricular stimulation induces running-bouncing clonus, tonic flexion, and tonic-clonic convulsions (both threshold and maximal tonic-clonic) by a current-dependent electrical activation of the brainstem nuclei that mediate generalized tonic-clonic convulsions.1214 In contrast to corneal stimulation, transauricular stimulation does not induce the minimal clonic seizures that involve face and forelimb clonus.1214 Transauricular stimulation has been hypothesized not to activate the forebrain mechanisms that mediate the face and forelimb clonus or clonic spasms, as explained in greater detail in Section III of this chapter. Transauricular stimulation produces electroshock convulsions at lower, more consistent thresholds than corneal stimulation.714 The threshold for tonic-clonic convulsions in mice is reported to be 4.0 mA with transauricular stimulation vs. 7.98 mA for corneal stimulation.7 Similarly the transauricular threshold for tonic-clonic convulsions is lower in rats, being reported as 17.4 vs. 22.9 mA in one study7 and 30 vs. 40 mA in another.14 Transauricular stimulation induces more severe convulsions, as the incidence of hindlimb paralysis714 and of animals exhibiting THE (in those populations that do not uniformly respond with THE)14 are greater than with corneal electroshock. It has been hypothesized that transauricular convulsions may be more difficult to control with antiepileptic drugs.14 In that regard, phenobarbital and primidone have been shown to be more potent in mouse MEST induced by corneal stimulation than by transauricular stimulation.7 These data indicate that the less severe corneal electroshock stimulus may detect anticonvulsant activity in experimental drugs more readily than transauricular stimulation.7 In addition, Löscher et al.7 have suggested that because the electrical stimulus must pass from the eyes to the brainstem, corneal electroshock may be a better representative of seizure spread mechanisms than transauricular stimulation.